Kick Off Summer at the 11th ECCP Football Cup in Nuvali! Organized by the European Chamber of Commerce of the Philippines (ECCP), the ECCP Football Cup is on its 11th year of providing a fun filled team building experience and networking opportunity for all participating companies. The 11th ECCP Football Cup will kick into gear on 16 April 2016 (Saturday) at the Nuvali Football Field, Sta. Rosa, Laguna. A fun event rather than a competitive tournament, it aims to gather 35 teams with over 600 participants playing in a two-division format – Mixed and Men’s Divisions.. The 11th ECCP Football Cup is open to all companies and its employees from top management to staff. To join, each company forms a team with a minimum of 10 and a maximum 15 players for either of the categories. For the Mixed Division, at least 3 female players must be included in the team and 1 female player should be on the field at all times. The fun cup will be played with a 7 aside rule including the goal keeper, no offside rule. ECCP is motivated by its objective in bringing Football, a European sport, closer to the Filipinos. Expect more excitement, giveaways and prizes in this year’s edition! What are you waiting for? Drag your colleagues with you and kick balls at the 11th ECCP Football Cup. 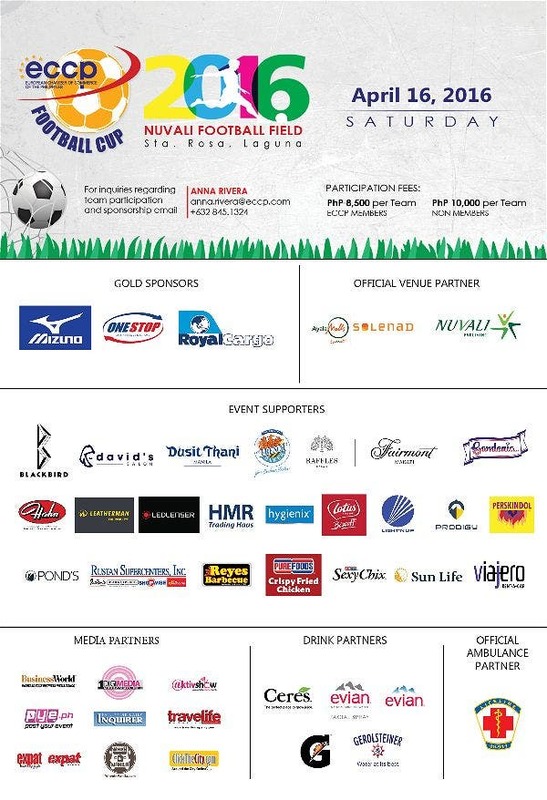 The event is made possible through the support of Ayala Malls Solenad & Nuvali as Official Venue Partner; Lifeline Support as Official Ambulance Partner; Mizuno, One Stop Distribution, Royal Cargo as Gold Sponsors; Blackbird, Buergli Pharma, David’s Salon, Dusit Thani Manila, Fairmont Makati, French Baker, Gardenia, Fly Ace Corporation, Rustan Supercenters, Inc., Reyes Barbecue, San Miguel Purefoods, Sun Life Financial Philippines, Viajero Rent-A-Car, Unilever Philippines, Willi Hahn Enterprises, and Light’nup Marketing as Event Supporters; Pepsi Cola Gatorade, Federated Distributors, Inc. as Drink Partners; Media partners include Business World, Philippine Daily Inquirer, Expat Magazine, Travelife Magazine, ClickTheCity.com, WHENINMANILA.COM, 1Digimedia Audiovisuals Inc., Aktivshow.com, and Pye.ph. For more information and inquiries the organizers can be emailed at football@­eccp.com .